I've got to admit that I was more than a little disappointed when I read this post by Mike Mearls. Apparently, the playtests will start out with just pregenerated characters. Even though I can't be sure of their reasoning because (to my knowledge, at least) nobody has gone into any detail on why they're doing it this way, I do think I understand. Using pregenerated characters insures that new groups start on roughly the same playing field. It reduces complexity. It forces people to focus on the mechanics of the game rather than the mechanics of character generation. It makes sure that the feedback they receive is based on known quantities. However, I'm still bummed. In my humble opinion, character creation is one of the most exciting parts of any RPG. Taking that away just bugs me, and I don't know how to shake the feeling. Honestly, it kind of makes me want to drop the playtest idea and just run 3.5, but make it known to my players that we're going to convert to the new edition whenever we get halfway decent playtest rules. Oh well. Time will tell. Maybe my players will be cool running characters that somebody else rolled up... but I wouldn't be. The D&D Next playtests, which have been frustratingly limited to a selected elite up to this point, will soon enter phase two and be open to a much wider audience of fans. 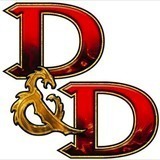 This news comes from Mike Mearls in today's post on the official D&D website. It also comes with news that Monte Cook has left the design team, and I find that quite unfortunate. In fact, I might have gotten really worried about the process if I hadn't been presented with such great news at the same time... good PR move, WotC. Indeed, the idea that I'll get to fool around with the new rules in less than a month is more than enough to overshadow the loss of one of my favorite designers. Bring it on! Let's get some playtesting in! 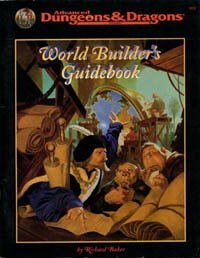 Way back in 2009 (the last time I spent any time on the Shadow's Apex campaign setting), I was building the world using a combination of the World Builder's Guidebook and Ray Winninger's Dungeoncraft articles. I created a loose framework for the campaign, including a map and some brief area descriptions, but never got around to many details. At this point, it looks like the possibility of running another 3rd edition D&D campaign might come up in the near future, and I want to go back to this setting. As the next campaign will likely be set primarily in the underdark, I'm going to need to work on the underworld. Obviously, other races will be present, but these will be the main races competing for power in the region. Next time, I'll give a little more detail to these power players. I don't want to go into too much detail because I don't want to violate the 1st rule of Dungeoncraft, but also because I want to leave room to flesh these things out to better mesh with my players' characters. When the Great Upheaval left the gods of light dead or missing, Araleth Latheranil filled their role as protector of the elven people. Araleth teaches moderation in all things but hunting down and ridding the world of evil. The Twylar have taken this teaching one step further. They have dedicated their lives to the eradication of evil wherever it is found, and they know where evil can be found in its purest form: the lightless caverns of the Underdark where the drow reside. To qualify to become a Twylar, a character must fulfill all of the following criteria. All of the following are class features of the Twylar prestige class. Weapon and Armor Proficiency: Twylar gain Martial Weapon Proficiency feats for the longsword, rapier, longbow, and shortbow if they were not proficient already. Spells per Day/Spells Known: At every odd numbered level, a Twylar gains new spells per day (and spells known, if applicable) as if he had also gained a level in a divine class to which he belonged before adding the prestige class level. He does not, however, gain any other benefit a character of that class would have gained. If he had more than one divine spellcasting class before becoming a Twylar, he must decide to which class to add each level for the purpose of determining spells per day and spells known. Twylar Spellcasting: Though not as versatile as other clerics, the Twylar are just as adept when casting traditional elven spells and those that affect light. The Twylar may add the spells from the Sun, Moon*, and Elf* domains to his spell list. When casting spells from these domains, the Twylar may use his character level as his caster level. Twylar Tactics: Araleth teaches that one must always be ready to take the fight to the drow whenever necessary. To this end, the Twylar train rigorously in tactics that give them an edge against their traditional drow foes. At each even level, the Twylar selects a bonus feat from the following list: Alertness, Blind-Fight, Combat Casting, Improved Counterspell, Spell Penetration, Greater Spell Penetration. *These domains can be found in both the Forgotten Realms Campaign Setting and the Player's Guide to Faerun. Note: This prestige class is based on the work of Chris Perry's "The Seldarine Revisited" in Dragon Magazine #236. I've been hearing a lot lately that the final game of the Mass Effect trilogy is just terrible, and I'm here to say... yes and no. It's really a mixed bag. Here are my thoughts... I'm trying to avoid spoilers here, but I can't completely, so consider yourself warned. Your decisions in previous games don't seem to make that much difference. Sure, there are some quests that you won't get if you let people die in previous games and whatnot, but for the most part your prior decisions come down to a difference in this abstract point total that decides how effective your army will be at the end of the game. That's just not enough for me. The story line seems a little too much like a railroad. There isn't really a point in the game when things open up and let you explore lots of different quests in whatever order you want. For the most part, you're stuck on a previously plotted course and you can only deviate a little bit. Even the order in which you bring the major races onto your team is decided ahead of time. What if I like Tali and want her on my squad first? Nope... sorry... gotta deal with several other races before you can even make contact with the Quarians, much less engage in that plot line. I want more freedom... it is an RPG, right? The "boss" fight was stale. Honestly, was there one? I remember thinking, "There's gotta be another fight coming up... any minute now... oh, now I'm limping... how is this boss fight going to work?" I just kept waiting for something else to happen. 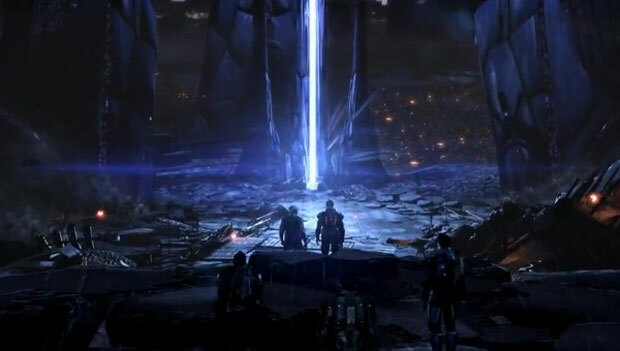 Mass Effect 2's final bit of action was probably too easy, but it was epic. Mass Effect 3? Epic on a broad scale, but too much of Shepherd's final role is just cinematic mumbo jumbo. I want to save the universe by blowing up the biggest baddest reaper in their fleet... not by choosing which path to walk down. Blegh. There was a return to the weapon customization options and such from Mass Effect 1, but the game was too short (and the ending too easy) to really feel like it made much of a difference. I tried to maximize the coolness of my weapons only to find that the next mission would start the "end of game" sequence, and there weren't any side quests left to pursue. Ugh... awesome game... awesome series... just too short... and a very anti-climactic ending. I'm so disappointed. Way back in 2008, I got this grand idea to go through the World Builder's Guidebook and Ray Winninger's Dungeoncraft articles to create a campaign setting of my own. My intent was to create an outline of this setting and chronicle it all in the same spirit as Ray's articles, revealing a bit of it each week until I felt satisfied with the setting. Unfortunately, after twenty four articles, I stopped. However, I think it's time to resume this old project, and I'm going to start with some quick links to those old posts just in case somebody wants to catch up. To view all articles on the Shadow's Apex campaign, some of which I might not have gotten around to linking on this page, click here. If there is one thing that has kept me from playing D&D lately, it's that the logistics of running a steady RPG have been seemingly impossible since I started graduate school. I do manage to write some RPG-related stuff on the blog here, usually random NPCs that I decide to stat out and post, and I'm still trying to keep my online Rifts campaign going as steadily as I can. Still, the sad truth is that time is at a premium in my life right now, and games like Magic: The Gathering just fit into my schedule with less hassle. How could this possibly work out while juggling a full time job and full time college course work? Honestly, I'm not entirely sure, but I'm willing to give it a shot. Here are some ideas that I'm thinking might help. Please feel free to contribute in the comments below. Game time rather than game night. We used to play every Tuesday from four o'clock in the afternoon until we decided that we had to stop or we wouldn't be able to wake up for work the next morning. Nowadays, that's unrealistic. Planning for a two to three hour session is about as time consuming as I can manage, and I think my players would say the same. Scheduling something like 7-10 on a weeknight or 1-4 on a Saturday would be much easier to convince people to put game time on their schedule. Periodic marathon sessions. To make up for all of the lost time from shorter sessions, it might be possible to schedule a marathon session a few times a year, when we meet for lunch on a Saturday and then play the rest of the day. These would be ideal for climactic battles or for times when long-lost players return for a visit, and would let us relive some of the old days from time to time. Sandbox-style story. In a sandbox, the players drive the story more than the DM provides it. This takes a lot of work off of me, as I'll mainly be improvising at the table and reacting to the players' actions, rather than building a story arc and spending my time predicting how the players will interact with it. Sandbox-style setting. I'm going to pull from material that I already have rather than creating a whole bunch of new stuff. I'll probably pull some encounters and locations from different adventure modules that I already have: Night Below, Menzoberranzan, various Dragon Magazine issues, and my Shadow's Apex homebrew campaign setting. Mix it all together and just see what the players do with it. Focus, focus, focus! We goof off a lot when we do have game night. Inevitably, we end up watching at least two or three YouTube videos that have absolutely nothing to do with the game at hand, and tell jokes, and talk about people we haven't seen in a while, etc. That's all good, and we could do that when we had 6+ hours to play, but when we're confined to 2-3, I'll need to do a better job of managing how focused we are. Mechanical shortcuts. Since this will be a D&D 3.5 campaign, I'm guessing the target stats for Pathfinder will be acceptable. I've still got the Pathfinder Beta pdf, so I'll use those as often as necessary to keep from needing to fully stat out monsters. All that said, I'm still open to suggestions. If anyone has any advice, please share! 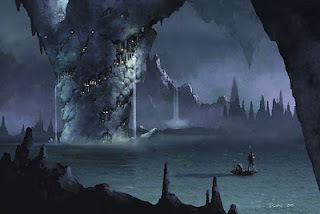 I've been brewing about the idea of a sandbox game set in the Underdark for quite some time, but I'm just now getting to the point of gathering info and presenting it to my players. I actually ran something similar back in the 90's when we were playing 2nd edition and were all reading the Drizzt novels. My players and I were all middle and high school students, and all we knew was the Underdark through Drizzt's eyes. The party consisted of a drow fighter and a drow fighter/mage. Both of them were dual wielding (the fighter/mage had scimitars), and both of them had ties to the Do'Urden family. All we knew at the time was the Drizzt series, the Fiend Folio, and Drow of the Underdark. What can I say? We were fanboys in the worst sense. But things changed over time. 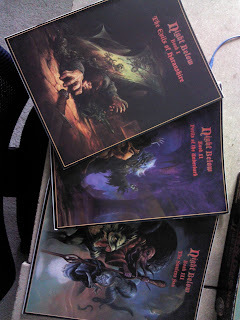 I haven't played D&D with the guys in that campaign in over ten years, and my drow reading list has expanded to include the War of the Spider Queen series, the Starlight and Shadows series, as well as 3rd and 4th edition sourcebooks on the drow and a handful of third party supplements. My favorite drow from Forgotten Realms fiction is now Pharaun rather than Drizzt. I still think it's a shame he died at the end of the War of the Spider Queen series. Needless to say, my horizons are much broader than that initial drow-focused campaign. I think I can do a much better job of it. In any case, I would love to revisit the Underdark setting, not as an occasional visit in a typical campaign, but as the primary setting for the campaign itself. In the same spirit as (and perhaps drawing material directly from) the Night Below campaign setting, characters would need to find allies in the Underdark rather than just seeing everything that isn't a dwarf as an enemy. My players already know that many of the Underdark races are my favorites, so seeing a steady supply of opponents such as these wouldn't be entirely out of the ordinary. However, there are many Underdark races that I have used very sparingly and that I would like to give a shot. Mind flayers, beholders, derro, and aboleth immediately jump to mind. As far as sandbox settings go (I feel like I need to explain because I'm not sure my players are familiar with the term), this would not be a story-driven game. Rather, the game would begin with some sort of story hook to explain why they're together as a team, but thereafter the players themselves would be the movers and shakers of the campaign. 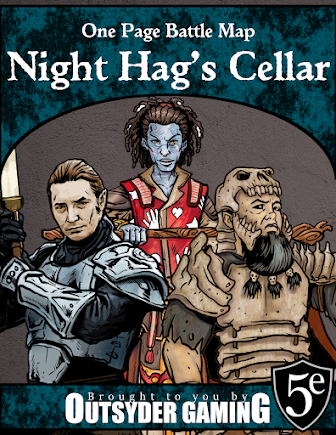 The DM creates the setting but doesn't have a particular story line to follow, allowing the players to explore Morrowind/Oblivion/Skyrim-style and building the story as they go based on player actions. Note: I'm sending this link to my players in order to get some feedback. Even though I'm a little bummed with D&D 4E and my instinct is to migrate back to 3.5 between now and the release of D&D Next, this bit of news is exciting to me. I don't want to spoil too much with text... I'll let you watch the video first. First of all, GaleForce Nine (GF9) has been releasing products for D&D for a while now. Vinyl battle mats, character tokens, odd "invisible" miniatures, blah blah blah. I haven't really been excited about any of it. However, GF9 has been putting out products for tabletop wargames for a while too, and I've been quite impressed with their Battlefield in a Box line. Even though I don't own any myself, I have gotten to handle a few of the gothic pieces at a game shop, and as soon as I find the money, I intend to put a few on my tabletop as well. How does all this tie together? 3D terrain for Dungeons & Dragons. That's right folks, and it's starting with stuff for Underdark encounters. Check it out right here. As long as they aren't a huge wallet-buster, I'm in. The Urban Underdark Dungeon Tiles sounds cool. I have tons of the old Dungeon Tiles sets, but the one thing that I always thought these sets lacked was transition tiles. I found that making the transition from a natural cavern to a stone floor just wasn't pretty because there weren't many (or any) tiles that showed that transition. The later sets started to remedy this, but by that point 4E was in full swing and we were playing more 40K than we were D&D, so I stopped buying them. What's my point? 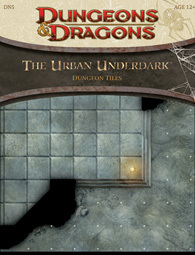 The Urban Underdark has a transition tile on the cover. I think this will be a product I can get behind. Am I going to run a Forgotten Realms campaign centered on this event? Nope... but I'm a huge fan of the drow, and I'm all for more Underdark products. Keep them coming, WotC! By the way, when is Vhaeraun coming back?